Jump! Jump! Jump! Creating our own earthquakes. Earthquakes created by jumping and moving the ground up/down. First Row: two different children participate at Northgate Crossing’s STEM Fair. Last two photos: children are jumping as hard -and as in sync- with eath other to make the “screen wiggles” move up and down. This lesson provided an introduction to ground motion and seismic detection methods. 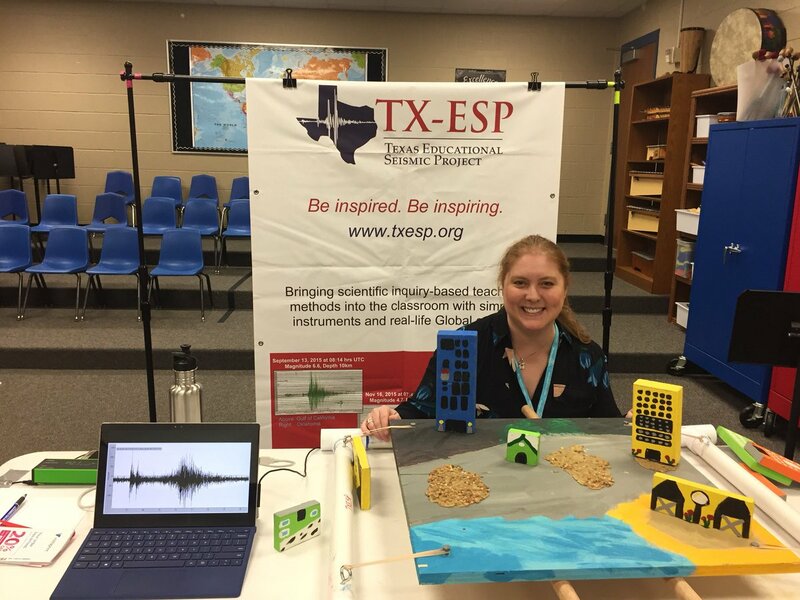 Texas Educational Seismic Project (TX-ESP) was founded by Kristi Rasmusson Fink in 2014. Kristi received her B.S. in Geophysics and Mathematics from Texas Tech University. During that time, she was a Math tutor for incoming freshman at TTU. Kristi earned her Master of Science in Geophysics at Boston College. Working as a geophysics teaching assistant fueled her passion to share the excitement of earth science and how it affects public policy. Kristi worked in the Oil & Gas Industry for twelve years. During that time, Kristi was actively involved in science outreach programs and events. Kristi’s passion for scientific inquiry motivated her to continue working within communities. She has served as an ExxonMobil Science Ambassador, Houston public school speaker, classroom teacher’s aide, and she has judged local science and math competitions. She taught physics sessions at Expanding Your Horizons’ Math & Science Initiative for Girls (Nacodoches and Austin, TX), and she served on the Coordinating Committee at ExxonMobil’s National Bring Your Child to Work Program. TX-ESP is Kristi’s new journey to give back to her local community. TX-ESP was founded to help expand the minds of children – to enable a child to learn how to think, analyze and apply scientific methods, not memorize lessons. We strive to motivate children’s natural inclination towards inquiry about the world we live within. Kristi and her husband live in the northern Houston suburb – Spring, Tx. They have two children. Parenting has given her insights about how her children learn and what they observe thru their perspectives.